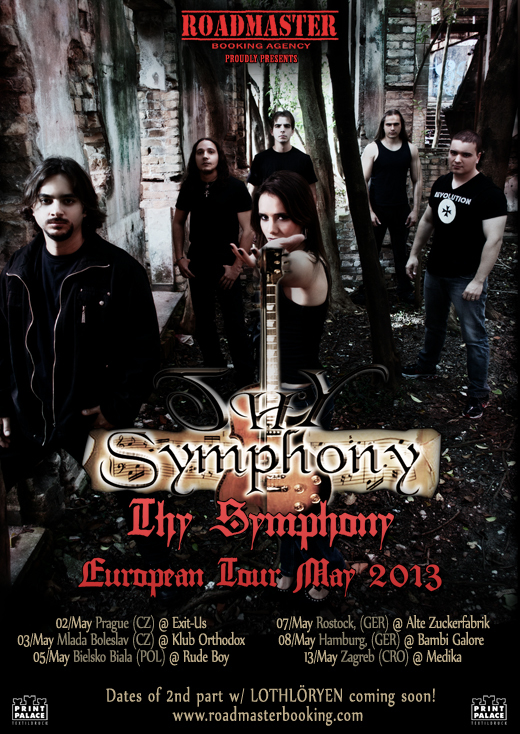 It is with great pride that the agency Roadmaster Booking announces the dates of the first part of the THY SYMPHONY Eurotour 2013. The Symphonic Power Metal sextet from Sao Paulo have gigs in Czech Republic, Poland, Germany and Croatia and will be releasing both songs from their second album “A New beginning” – released on 5 April by the European label Sleazy Rider Records – and tracks of the album “The World harmonizing”. The second part of the tour will be also with the participation of the sextet Melodic / Power Metal Folk LOTHLÖRYEN with concerts in Hungary, Romania, Bulgaria, Greece and Italy.